Welcome Everyone! I hope you've had a beautiful weekend. With our temperatures warming up, and the lane clear, the shop was busy. Now, time for a visit with all of you. :-)) I'm linking up today with Beth from over at The Gypsy Fish Journal. She has graciously started this new meme. I just discovered it the other day, so glad I did. I am amazed at all the beautiful pieces of silver you blogger's have, each used in their own unique way. Now, I don't have a lot of silver, would love to, but what I do have, I love and cherish. I chose to put together 2 vignettes using two different pieces of silver. I chose the letter holder in the first vignette. I think the crowning glory would be to have vintage post cards in the holder. Aaaahhhh... a dream for another day. The second piece is the ink well. Anyway that's what I call it. If any of you know the actual "true" name I would love to hear from you. I can also see this used as a candle holder, can't you? Love your pretty vignettes. 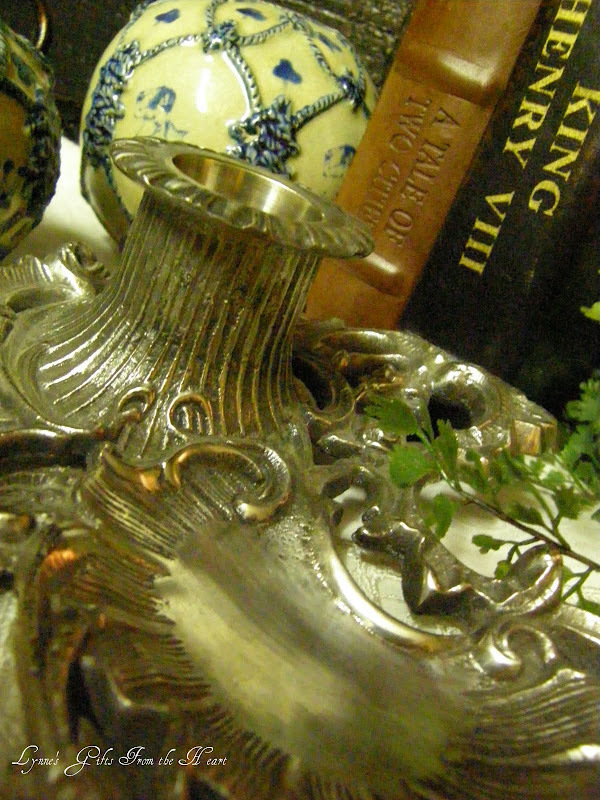 Your silver is lovely- the 'inkwell' would make a great candle holder. What a pretty desk set. The ink well probably had a glass insert at one time. The blue and white orbs are very pretty. I don't have very many silver pieces, but I do like silver ....it's just not my favorite. Your vignettes are lovely. I love the letter holder and a quill would be gorgeous by it! Both vignettes are beautiful. I love your pieces of silver, and the old lace looks so pretty too. I wish I lived close by, I have lots of vintage postcards passed down to me by a great-great aunt. I'd have loaned some to you. Ohhh...I just had to come by and see your silver! What beautiful pieces, Lynne! 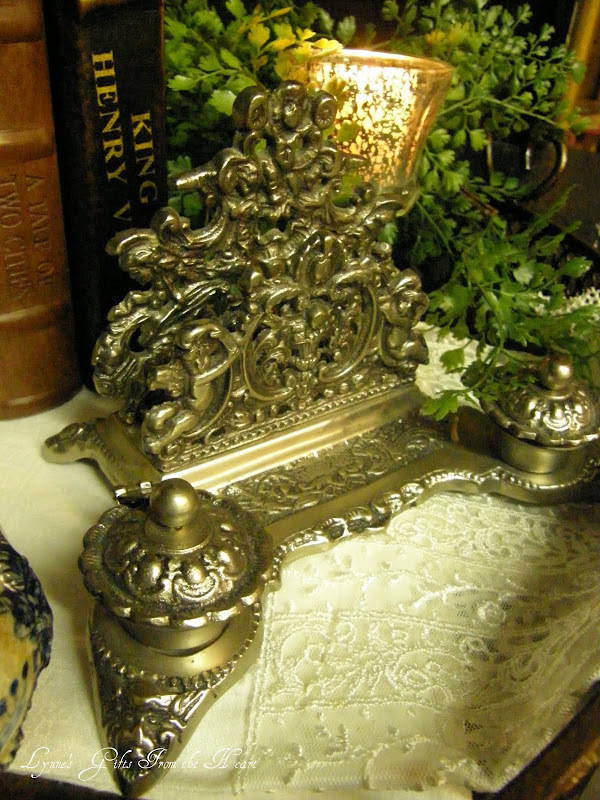 I love the silver letter holder...so ornate! I'm wondering what the two little covered places on the front of the letter holder are? I've never seen one like this so it's such a treat!!! Ohhh...and the little silver ink well...exquisite!!! It really looks so frenchy...don't you think? I think it would be beautiful used for a candleholder too...great idea!!! Well Darlin', your silver vignette is gorgeous!!! I love the look and feel of it with the two beautiful old books and those decorative balls (those are definitely frenchy looking!) I love it!!! Thank you so much for sharing your silver pretties and your fabulous creative talents for doing vignettes with us, my friend!!! Have a wonderful weekend, Darlin'! Your silver is gorgeous and all of your vignettes SO pretty!! I have a little bit of silver but not as much as so many of you ladies seem to have. Love these! Blogger isn't letting me schedule posts and the post about the baby was supposed to post on Monday. I changed it to a draft and it deleted the post so I'll try to remember to post it on Monday, maybe Sunday bz I'm off Monday. Can you still schedule posts? Mine just post automatically now and I hate it bz I don't always have time to do a post the day I want it to post but may have time before, AUGGGGGHHH! Oh, I haven't done a crazy quilt with feathers. On my side bar you'll find some wonderful quilting blogs and maybe you can find one on one of theirs. I'll keep my eyes posted for you too! Good luck and I'm excited to see it when it's done! I hope Mr. P's tests go well too. Lynn...it's wonderful to meet you and see your lovely silver. What a gorgeous old piece! I did enjoy your contribution to Silver Sunday. I love the letter holder and agree that vintage postcards would be a perfect addition. Mmmmmmm love your little displays and that silver ! What an unusual silver piece, very ornate. 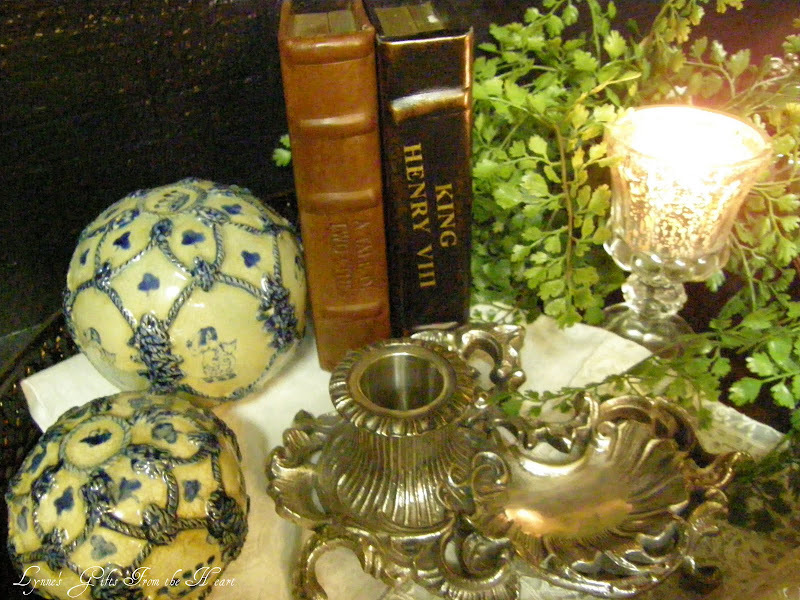 I had many silver pieces, once, but cleaning silver took up too much of my time, so little by little I gave most of it to a friend, who loves to collet it and has a whole china cabinet filled to the rim with it. I did just buy some new silver polish, I would like to clean up the silver coffee & tea server that my husband bought for me, that is something I won't give up. To answer your question, yes... my husband is laying the floors himself. We do just about everything ourselves, except putting in our own pool or a new liner, that we leave to the professionals. We just get great satisfaction out of doing it ourselves. Thanks for your visit. By the way, your taking great pictures with your camera. Your two ink wells are just stunning! The one with the letter holder is so detailed and beautiful! The other one with the little area for your pen to lay, is just gorgous! I have never seen one like that. i love them! ah looks like I was a tad too late to join in...but sometimes blogland window SHOPPING can be nice too! Add a quill and some parchment...and I'm there! That is one fancy letter holder, and ink well. Thank you for the invite to Facebook, but i dare not sign up. I spend so much ti me on computer with blogging, I'm afraid I would be just as addicted to Facebook, and never get anything done! Beautiful letter holder!!! love both pieces. Thanks for sharing, Happy Silver Sunday. 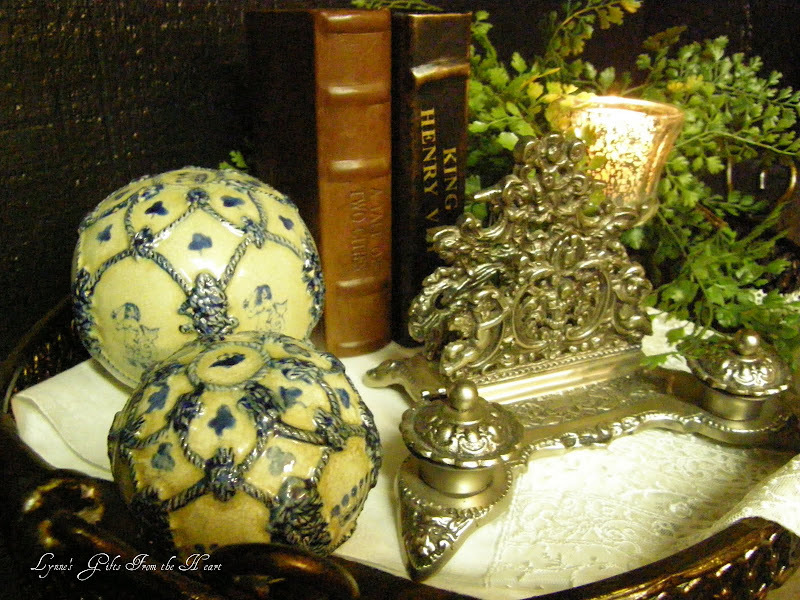 Great silver pieces...I love the detail on both inkwells and your vignettes are beautiful. Thanks l, for the warm welcome for my little tater bug! I am loving this granny stuff... he is a doll and has already stole my heart. Beautiful vignettes in your photos. Hi Dear Lynne! 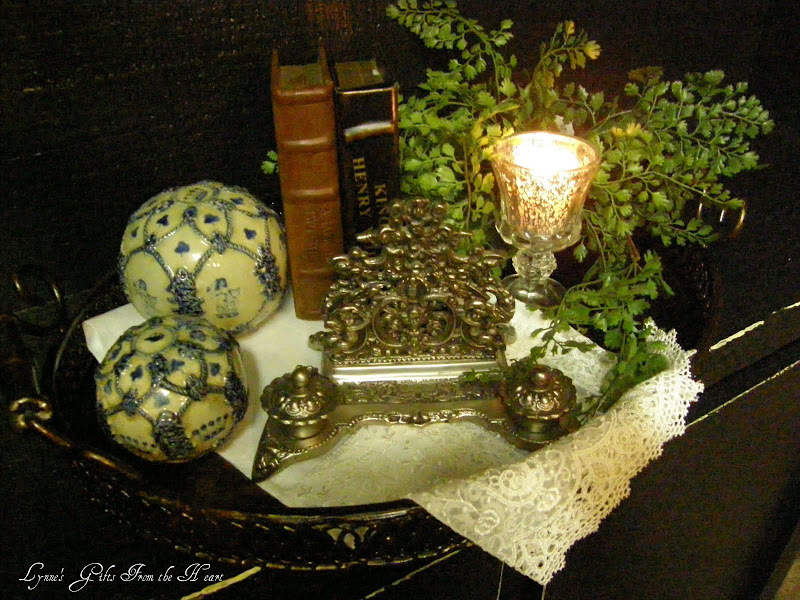 Oh, what beautiful silver pieces you have and you've set a beautiful vignette with them! I would so love to see your beautiful home in person! Thanks for popping in to see me! I've missed you! Hi Pat, isn't the melting snow wonderful, now with the shining of the sun the day looks even better. Beautiful ink wells. Thanks for sharing. 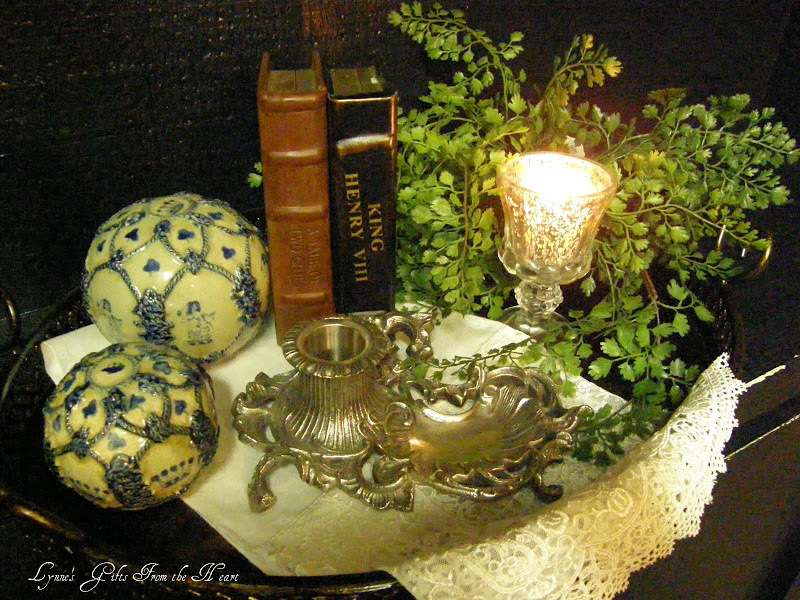 Lynne, your silver is beautiful and I LOVE this vignette! That lace is exquisite!! I just love it! Lynne... I love your ink well and your carpet balls - just beautiful! what a beautiful candleholder! love it! 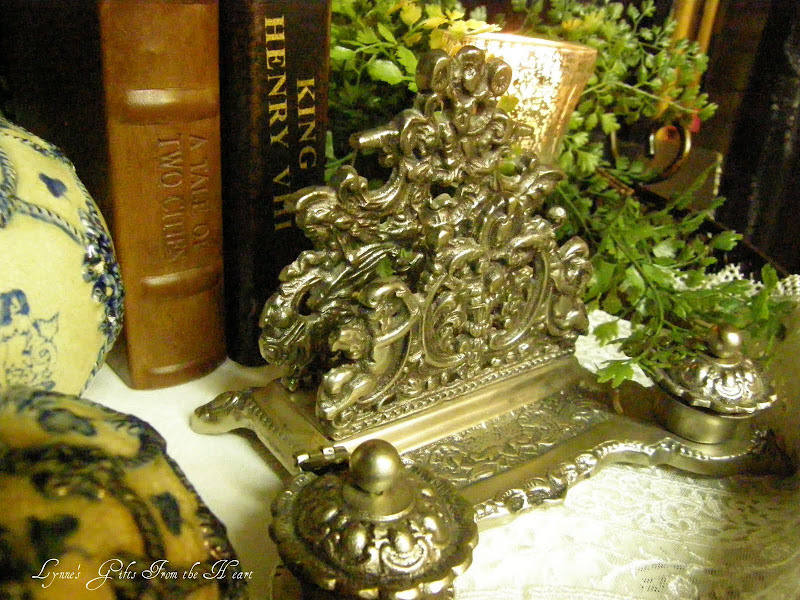 Wow, what a gorgeous piece of silver, and another lovely vignette. Hi Lynne, love your silver ink set, it's really gorgeous, and I love your white hutch with all the goodies on it! I like to keep things fresh also. I change things up frequently! Hope you are having a great week!